Henry Goodman Q & A. Once again a thoroughly absorbing and enjoyable session at Holy Trinity Parish Hall with perceptive questions from an audience who had clearly relished Henry Goodman’s past performances at the RSC. Henry, about to tread the boards in the evening performance of Volpone, shared his thoughts on his much lauded role as the fox of the title illustrated with fascinating insights into the challenges of playing the avaricious thrill seeker. He spoke at length of his admiration for Ben Jonson and how Jonson’s life had equipped him to understand the impact of greed on the very rich and the poor. 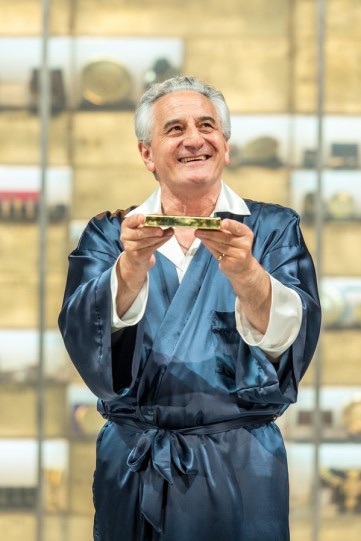 Henry Goodman has earned critical acclaim for his roles as diverse and taxing as Shylock, Richard 111, and the multiple impersonations in Volpone. Henry insisted however that no matter how entertaining his interpretation or how entertaining his comic parts these mean nothing if the audience is not convinced that the acting is true to the text. Henry’s thoughtful and self effacing approach to his work was most apparent in his reflections on teaching young actors and the social and political challenge of making Shakespeare and Jonson accessible to new audiences.